Thank you for your company this afternoon. If you missed any of the action from the early Championship game today, you can read Ged Scott's match report where there will also be more reaction from both managers. Wolves temporarily move up to sixth in the Championship play-off places ahead of the other games today. Huddersfield's three-game unbeaten run comes to an end and they lie 16th for now. "As an attacking player you always want to score goals. "Ive been doing fisnihing after training and luckily it fell to me today and I was able to put them in. "To get three goals today and on Tuesday against Fulham is a massive thing and we wanted to build on this with the international break coming up." "To be honest with you I thought the keeper saved my goal and it and it went out for the corner. On his recently signed new contract: "I'm over the moon to sign a contact and thankfully everyone worked hard and it is sorted now. For the first time since 1988, Wolves get the better of Huddersfield on home soil. Kevin McDonald's super curling strike was in a first-half with few highs, but Wolves were dominant after the break and Benik Afobe's two goals secured the win. 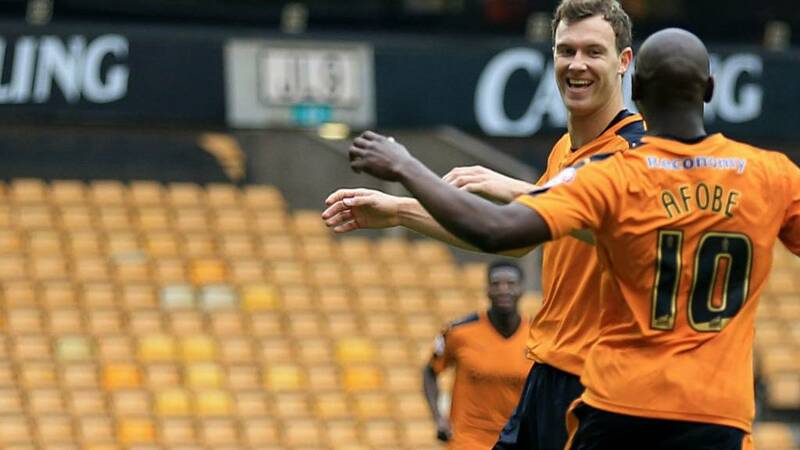 Afobe was not even born the last time Wolves beat the Terriers at Molineux! Dean Whitehead gets a booking in the closing stages for a slightly rash challenge. Wolves play the ball into the corner looking to waste a few seconds. We're going to have three more minutes at Molineux. Captain Dean Whitehead is still giving everything to the Huddersfield cause as he exchanges some words with Wolves boss Kenny Jackett. The referee has a word with Jackett and we're back on with the final few minutes of football. And that will seal three points if they were ever in doubt. A hopeful ball forward by first goalscorer Kevin McDonald finds a sprinting Benik Afobe who touches it away from the defence and is composed to finish in the bottom corner. Kenny Jackett's side heading for back-to-back league wins for the first time this season. The hosts use up their final change as Matt Doherty replaces winger James Henry, who has had an impressive second half. Benik Afobe very nearly setting himself up for a second as he powers into the area, but some last gasp defending denies him getting a short away. "The threat of getting the hook clearly did do the trick for Afobe as Adam Le Fondre set up his fifth goal of the season. "Le Fondre then should have netted himself, but for an astonishing decision by the ref, who turns down a 'stone waller' of a penalty. "You see some bad decisions made by officials week in, week out and it's so much easier to referee a game from the stand, but it did not need any TV slow motion replay to decide on this one." Dave Edwards was going to be part of a double Wolves substitution earlier, but now the midfielder gets his chance. He comes on for Adam Le Fondre with Benik Afobe leading the line on his own now. The changes almost have an immediate effect. Best opportunity of the second-half for Huddersfield as Nahki Wells' strike forces a full strech Emiliano Martinez to push the ball away. Chris Powell uses up all his substitute options by bringing on Jonathan Hogg for Emyr Hughes and Jamie Paterson replaces Harry Bunn. What can they create in this final 10 minutes? “It’s been a good second half performance from Wolves. Nahki Wells getting into a decent position inside the Wolves area but he is unable to work anything and the hosts begin knocking the ball around again. Wolves keeping possession deep in the Huddersfield half and the visitors are struggling to get out. Jack Price intercepts and drives towards goal but his long range effort is easily gathered into the chest of Jed Steer. Wolves fans not happy with the referee Chris Kavanagh there. First a high foot from Dean Whitehead goes unpunished, then he gets in the way of an attempted through ball. Nahki Wells effort on the turn is the one of few Huddersfield have managed to carve out this half. James Henry has really looked in the mood in this second-half. The winger curls a beauty of a free-kick towards goal from 25 yards out, but it is just past the right post. A minute later, he works himself past a couple of defenders but his chipped effort over the keeper drifts over. Jack Price is next in the book for Wolves for a poorly-timed challenge on the halfway line. A sloppy back pass by Huddersfield lays in Adam Le Fondre and as he attempts to round Jed Steer he appears to be brough down for a clear penalty. The referee sees it differently though, saying the striker was looking for it by leaving his leg dangling and he is booked. The four-game goal drought is over. A ball over the top finds Adam Le Fondre who looks up from the left side of the area and he lays it onto a plate for his strike partner Benik Afobe. His fifth goal of the season and 50th in his career. The corner comes to nothing. Wolves though build again though and it is that man Dominic Iorfa who delivers from the right. He's enjoying the freedom of the right wing at the moment. Surely it is a matter of if, not when, for a second Wolves goal? Substitution now made by Kenny Jackett. Sheyi Ojo is replaced by Nathan Byrne, the man who he replaced in the starting line-up today. Superb, vicious curling strike by Benik Afobe from the edge of the area and Jed Steer had to have strong wrists to turn the ball wide. Wolves completely on top at the moment. Again Dominic Iorfa getting forward well and his involvement gets the ball to James Henry who forces a save from Jed Steer from long range. Wolves preparing two substitutes of their own now. First change of the game and Huddersfield boss Chris Powell replaces Mustapha Carayol with Nahki Wells. A quick throw by Benik Afobe finds James Henry, but the winger's through ball to Adam Le Fondre is just to heavy for the striker to control and the chance is gone. Just as Huddersfield were in charge of the opening exchanges in the first-half, Wolves are taking the game to Huddersfield at the moment. They lose possession well forward though and the Terriers work it to Ishmael Miller and his shot is into the side netting. Wolves should have doubled their lead. Again Dominic Iorfa gets forward well and the right-back delivers a superb ball into the six yard area but James Henry only gets a glancing touch with the goal gaping. A swift counter attack by Wolves finds Sheyi Ojo on the left. After a few drops of the shoulder, the wide man unleashes an effort the clips the top of the net. Jed Steet seemed comfortable enough it was never going in. Something for the crowd to get excited about. Positive wing play from Wolves' James Herny who nutmegs a defender and whips in a decent ball that is headed away. From the resultant throw in, the visitors clear. Benik Afobe turns and runs at Huddersfield but his final ball is poor. He attempts to find Sheyi Ojo but it is easily cut out. Wolves get us going in the second-half and Dominic Iorfa mis-controls a pass in the opening 20 seconds. Both teams are back out at the overcast Molineux and we are just about ready for the second 45 minutes. Don't forget to stick with us on BBC Sport throughout the afternoon where we have you covered for all your football needs. There is the live football text service with a round up of news around the country or how about getting alerts for every time a goal is scored when your team scores on your phone? Find out here. Then later, if you are not of an X Factor or Strictly Come Dancing persuasion, stay with us this evening for build up and commentary from Twickenham in England's must win game against Australia at the Rugby World Cup. “I think it’s what you’d call a typical Championship game – not much to choose between the two teams, but plenty of blood and guts and plenty of commitment. “Wolves were slow out the traps and a little bit shaky in the opening stages, but that one moment of quality from McDonald is the difference. Fancy buying a West Midlands club? Perhaps the reason for a subdued atmosphere today might be away from the pitch, as Wolves joined local trio Aston Villa, West Brom and Birmingham in looking for new owners this week. Liverpool-born Morgan, who founded the Redrow house-building company, famously bought the club for £10 in 2007. Here are the numbers from Molineux so far. Wolves enjoying slightly more of the ball in the opening 45 minutes, but Huddersfield have had more efforts at goal. Work for manager Chris Powell to do in the dressing room. "Wolves might be 1-0 up but, other than the occasional 'ooh', 'ahh', 'what game are yow watching referee?' Molineux has all the atmosphere of an empty building site. "Apart from Kevin McDonald's goal and a gaping chance Benik Afobe ought to have done better with, Huddersfield have carved out the majority of chances in a sleepy first half that must have long since had the TV audience at home heading for their kettles - and other more exciting electronic devices!" Huddersfield enjoyed the better of the opening stages, but Wolves lead at the break through Kevin McDonald's second goal in a week. The midfielder curled a beauty from the edge of the area after some clever build up work. Ishmael Miller and Emyr Huws have tested Wolves keeper Emiliano Martinez but have not carved the hosts open too many times. Two minutes extra time at Molineux to try and nick something before the break. Emyr Huws bursts into life, beating the Wolves offside trap. He controls the ball well but shifts the ball to his right foot inside the area, and his curled effort is saved well low down by on loan Arsenal keeper Emiliano Martinez. It is walking pace at times now from Wolves who are just looking to close out the half in the lead. They lose the ball though and will be grateful Ishmael Miller's touch into the area is a heavy one as he looses the ball. It seems that Wolves' fans have only just remembered Ishmael Miller's West Brom connections as he gets roundly booed with his next touch. Dean Whitehead powers a header to the edge of the area but Wolves clear the danger. Wolves nearly causing their own downfall. They lose possession in the left-back area after a throw in and Huddersfield work it to Ishmael Miller but his shot from a tight angle is straight at the chest of Emiliano Martinez. Right-back Dominic Iorfa gets forward for Wolves, but his right wing cross is cut out by Elliot Ward. A real lack of tempo in the game at the moment. Huddersfield play some neat passes in the Wolves half, but after the hosts cut it out the ball over the top finds Adam Le Fondre offside. In a half of few highlights so far it is worth reflecting on Kevin McDonald's goal. This is the view from the Wolves side, which roughly translates as shot with lots of curl on it! An innocuous looking ball into the box finds Wolves striker Adam le Fondre and Jed Steer races out well to block his effort with his body. "Beautifully taken goal from Kevin McDonald. "But the home side are ahead against the run of play in their first game since the announcement that current owner Steve Morgan plans to sell up after eight years in charge after buying the club from boyhood Wolves fan Sir Jack Hayward - and the ironic cry from the South Bank is one of 'Stand up if you love Sir Jack'." Neither side making much of an impression on the game at the moment. Adam Le Fondre plays the ball into Sheyi Ojo in the box, and as the on loan Liverpool winger stretches for the ball he catches Joe Lynch and is booked. Wolves enjoying some possession now after that goal which seams to have given them a lift. Benik Afobe makes a burst down the left but his cross comes to nothing. Expertly controlling the ball in the centre circle, he plays a neat one-two and then unleashes a curling effort from the edge of the area into the bottom right corner. Lovely goal, his third this season. James Henry's delivery is poor and easily gathered by Jed Steer. Huddersfield tried to counter but Dominic Iorfa marshals Mustapha Carayol well this time. Back on the pitch after his knock, Huddersfield defender Martin Cranie pulls back Sheyi Ojo and is the first booking of the day. There is a subdued atmosphere around Molineux at the moment from the home support and in fairness that have not had much to shout about. Martin Cranie off the pitch for a moment receiving some treatment. A wild swing of a clearance from Dean Whitehead and it falls kindly to Benik Afobe behind the Huddersfield defence. His is unable to control it properly with his first touch and eventually Sheyi Ojo's deflected shot is gathered easily. Wolves unable to get hold the ball at the moment with Mustapha Carayol, Ishmeal Miller and Harry Bunn all causing problems in their half. The Terriers are looking lively up top but are unable to carve open a chance this time. A driving run from Benik Afobe and he lays the ball off to James Henry whose whipped cross is palmed away by the goalkeeper and momentarily causes confusion in the box. Again Huddersfield get some joy down the left, with Mustapha Carayol and Wolves fans have not had much to shout about yet. From a corner the ball falls to Dean Whitehead and his shot inside the area is pushed away. “It’s been a flat start for Wolves. "They haven’t got any tempo or ball retention going. Huddersfield are certainly causing Wolves problems in the wide areas. Chris Powell's side have certainly settled quicker here. Sending the ball forward early, Ishmael Miller wriggles away from the defender and drills over from a good 30 yards out. The former West Brom striker is looking for his first goal this season. First chance of the game and this time Musthapha Carayol beats Dominic Iorfa. The on loan Middlesbrough winger fires a curling shot from the edge of the area but Emiliano Martinez dives to his right to save well. Shortly after, Carayol sets up Harry Bunn put he fires over. "Huddersfield started the afternoon 16th in the table, five places below Wolves - but only two points behind. "They're looking to repeat their 3-1 win here at Molineux, almost exactly a year ago the day. "Wolves won the return game in West Yorkshire 4-1 in February, but otherwise have a very poor record against the Terriers in recent years." First corner of the afternoon goes to Wolves and Elliot Ward just beats the oncoming Wolves attackers to the ball for another corner. The next ball in lacks quality and Huddersfield have a goal kick. The Terriers enjoying some early possession in Wolverhampton. A good break my Mustapha Carayol tees up Dean Whitehead but his shot is blocked on the edge of the area. After a pre-match huddle from both teams, Huddersfield get us going. Here we go then from an overcast Molineux at the moment. Danny Batth and Dean Whitehead lead their sides out. "With half an hour to kick-off at Molineux, the ground was still almost empty - and only filling up slowly. "With the comparatively smoothly flowing level of traffic outside, it does not look like being the biggest gate of the season. But then, with a lunchtime kick-off, and the game being shown live on TV, it's hardly a surprise. "Wolves can climb into the top six, at least temporarily, if they can repeat Tuesday's win at Fulham - the biggest win in seven months for Kenny Jackett's men." If you are lucky enough to live in the Midlands or Yorkshire, you can also follow the game on your BBC local radio station. BBC WM and BBC Radio Leeds both have coverage from Molineux. Unfortunately a rights issue prevents us from bringing you the commentary online. Good news for fans of the Terriers heading into today - Wolves are without a home win against your side in eight league games (L4 D4), with the last victory coming in November 1988. The other news I shall leave for you, without comment, is your side shall be playing in this grey and white camouflaged style kit, with red trimming. It is certainly different. Subs: Allinson, Smith, Hudson, Hogg, Paterson, Wells, Billing. Huddersfield manager Chris Powell names the same starting XI for the fourth game in a row. If it ain't broke, don't fix it I suppose. Former West Brom man Ishmael Miller leads the line for the Terriers upfront on his return to the Black Country. Subs: Ikeme, Doherty, Ebanks-Landell, Edwards, Wallace, Byrne, Enobakhare. Wolves make just one change to the side that impressively won 3-0 at Fulham in midweek. On loan Liverpool winger Sheyi Ojo replaces Nathan Byrne on the left side of midfield. Captain Danny Batth, who returned last Saturday after five months out with a foot injury, plays for the third time in seven days. Welcome to your early kick off in the Championship on a autumnal feeling Saturday morning. AfterBurnley beat Rotherham 2-1last night to kick off the Football League action for October, we're at Molineux this afternoon as Wolves take on Huddersfield. Now, who fancies some team news?